Malaga possesses numerous places of touristic interest. 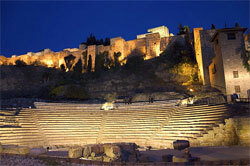 Its most famous sight is probably the hill fortress Alcazaba-Gibralfaro. This fortification dates from the Moorish occupation and was built on a Phoenician base. Next to the Alcazaba, an ancient Roman theatre can be found, so that these monuments give an excellent review of the different civilizations which settled in Malaga in the course of the centuries. Another very important sight in the centre of Malaga is the well-known Renaissance cathedral "Catedral de la Encarnación" (colloquially called "La Manquita"), which stands out due to the fact that is was never finished, so that it just has one tower instead of two. Not far away from the cathedral, the glamourous boulevard Calle Larios can be found which ranks undoubtedly among the most expensive streets of Spain. Following this boulevard up till the core of the historic centre, one soon gets to the Plaza de la Merced, where the birthplace of the world-famous painter Pablo Ruiz Picasso is situated. Another pleasant site to visit is the Parque de Malaga, a small botanical garden along the main street Alameda Principal. At the end of the park, one reaches a big intersection, and behind it the famous bullfighting arena of Malaga comes to the fore.